HDA TEAM | ARCHITECT LEAD DESIGNER : Hugh Dutton, Yingjie Yu, Gaëtan Kohler, Azhar Khan, Jean Huet. 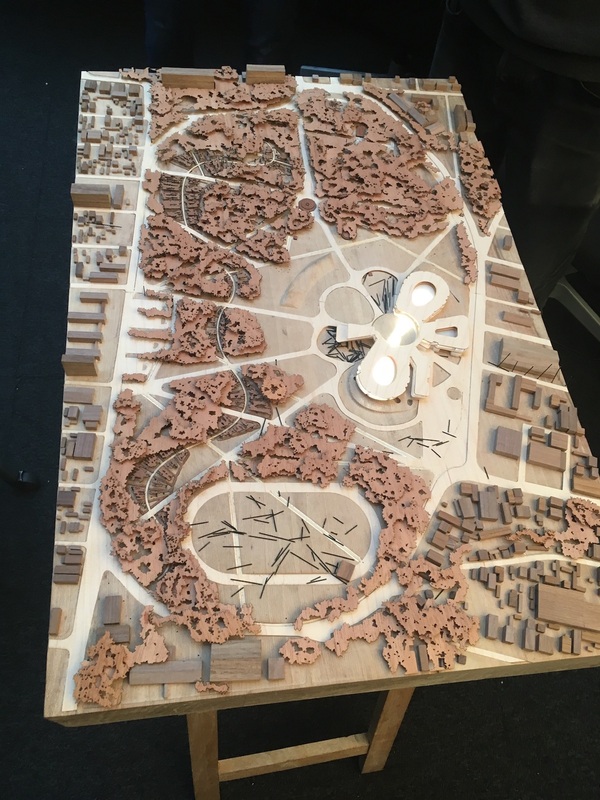 The spatial planning is inspired by the ideal of transparency of the government functions to the public, as well as critical functionality and ceremonial formality. All spaces radiate around a central lobby consistent to the philosophy of Jamaica’s motto Out of Many One People. 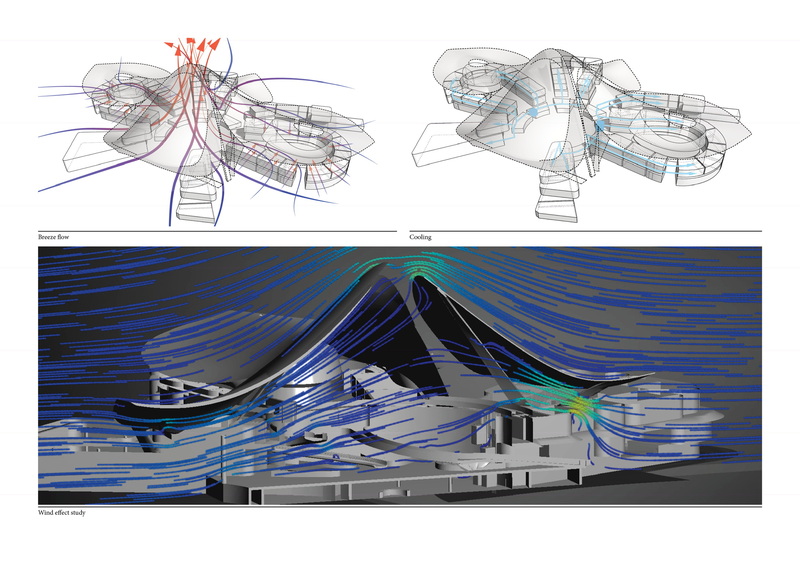 Different functions are arranged in independent pavilions surrounding the nucleus. The pavilions comprise firstly the Representatives/Senate chambers, each one independent. Then other pavilions such as Administration/Staff; Security/Media: the Museum and finally other support facilities such as gymnasium, restaurant daycare. The whole is made from diversity. 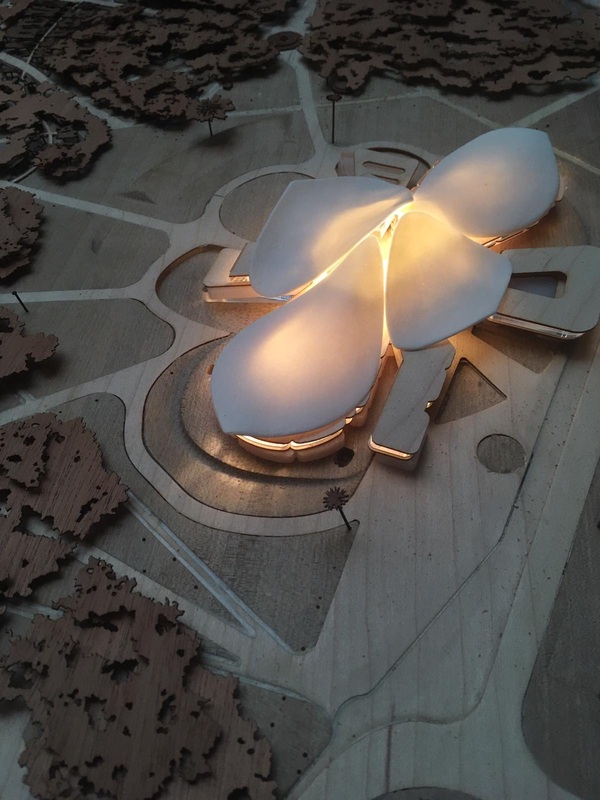 The pavilions converge at the centre and support the sculptural ‘petals’ that encourage cooling breeze flow. All office spaces have daylight and can be open to natural ventilation and fresh breeze. 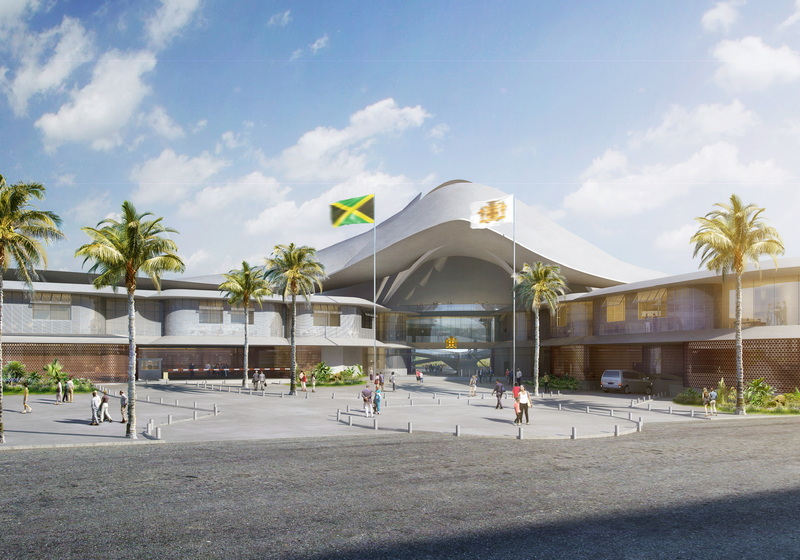 The proposed park design evokes the notion of “Land of Wood and Water”, bringing fundamental Jamaican character and activities and makes room for Music, Athletics, and Art. The memory of our heroes deserves a revival of their resting place. 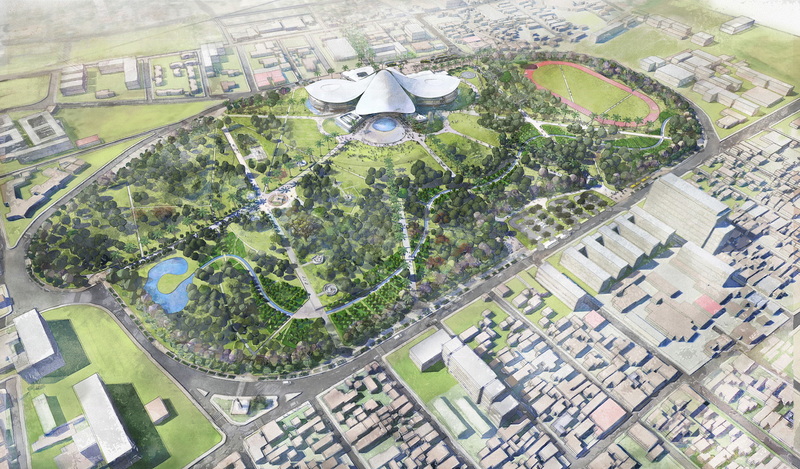 Their place in the proposed garden will be enhanced to provide all generations of politicians and the public with a fresh reminder of the context of Jamaica’s political heritage. The building is part of the park, and the park is part of the building. Both enriches each other by bringing a new venue. 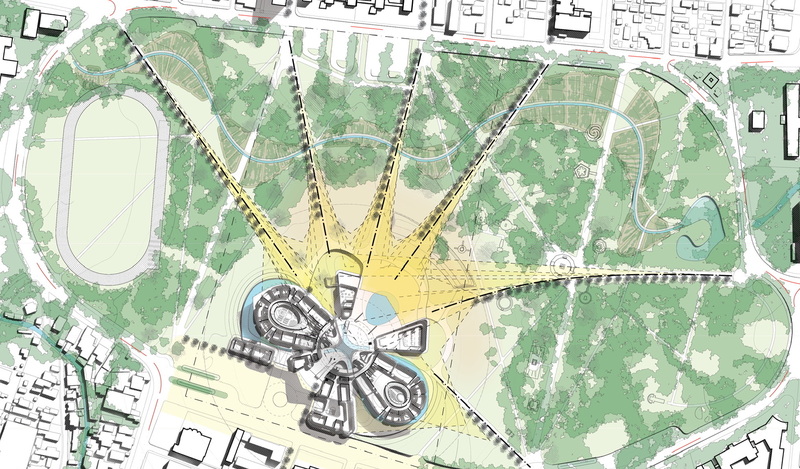 The building flows through the park, and the park flows through the building that is an open shelter. The full north-south axis of the park is retained. An urban address at a distinct location for approaching traffic from the most busy traffic routes. The east breeze crossing the site is best harnessed if the building is located at the east. Aerial photos allow us to track footpaths that have naturally been formed by the community as they pass through the park in their daily walks. These naturally formed pathways are evidence of how the community uses the park. This extensive network of pathways is paved and given complementary planting to recognise and formalise the ownership of the park by the community. 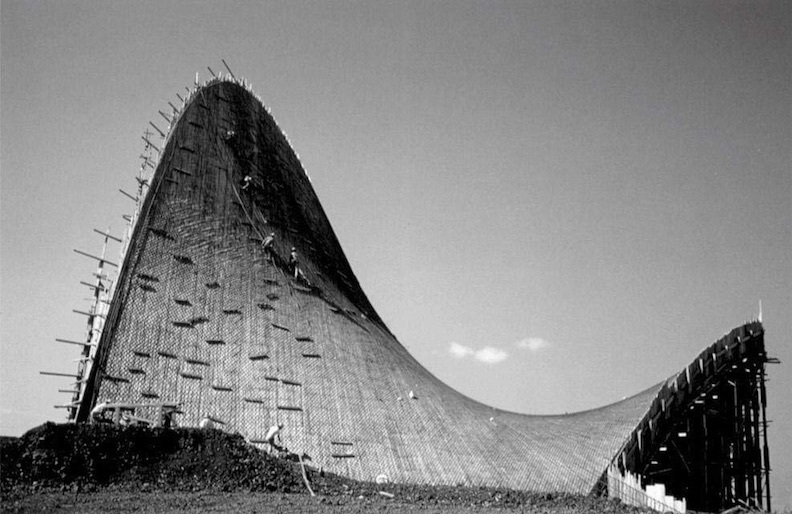 The concept of the Lignum Vitae flower petals as structural shells in cast concrete in optimal hyperbolic paraboloid funicular shapes celebrates an essential quality of Jamaica’s modern architectural heritage. These petals nestle together supporting each other along their edges as they raise to the sky. 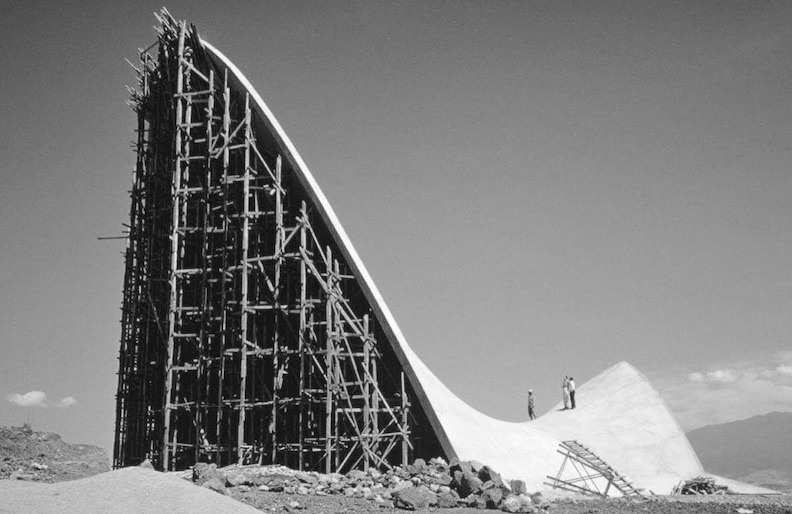 Using techniques from Felix Candela’s dramatic shells, they provide efficient forms whose geometry ensures their strength. Kingston has a cement factory and the concrete construction is a known and is a traditional technique on the island. This typology also invokes the memory of Jamaica’s own esteemed Architect Wilson Chong with his innovative concrete work. The materials are durable and silently resilient to earthquakes and hurricanes and the test of time. One of the biggest consumers of energy is air conditioning. Reducing the requirement for cooling is the key intent of the proposal. Generous roof shells cover the programme pavilions protecting them from the sun. They are oriented to capture the prevailing east-south-east breezes creating vertical airflow. This vertical flow beneath the shells is further accelerated by a solar chimney stack effect. The resulting vertical flow is intended to encourage breezes to enter each of the pavilions around their perimeters and be ventilated naturally when the climate conditions permit. Cooling workspaces is a necessity to improve working environment and productivity. Spaces are naturally cooled with breeze flow as was the traditional approach in Jamaica before the invention of air conditioning. To optimise energy consumption, complementary air conditioning or other means of cooling Is intended as a top-up to the natural ventilation cooling for seasons where it would be required. White surfaces of the shells reflect heat energy reducing the amount of solar heat absorbed. “THE PROCESS OF TRANSPARENT GOVERNMENT IS THE FOUNDATION OF A BRIGHT FUTURE”. All spaces radiate around a central lobby consistent to the philosophy of Jamaica’s motto Out of Many One People. 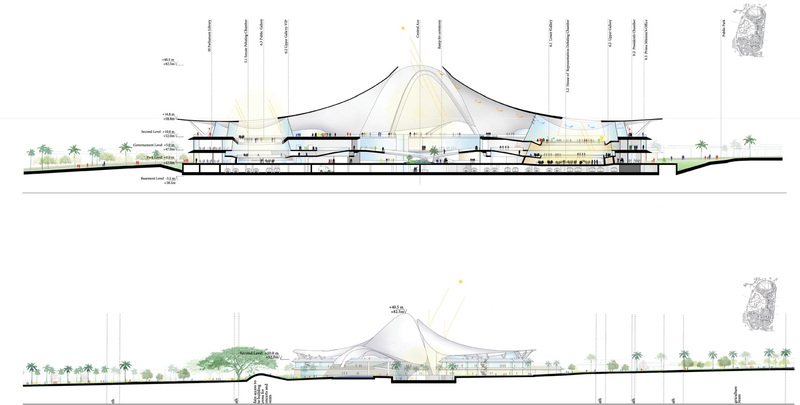 Different functions are arranged in independent pavilions surrounding the nucleus. The pavilions comprise firstly the Representatives/Senate chambers, each one independent. Then other pavilions such as Administration/Staff; Security/Media: the Museum and finally other support facilities such as gymnasium, restaurant daycare. The whole is made from diversity. 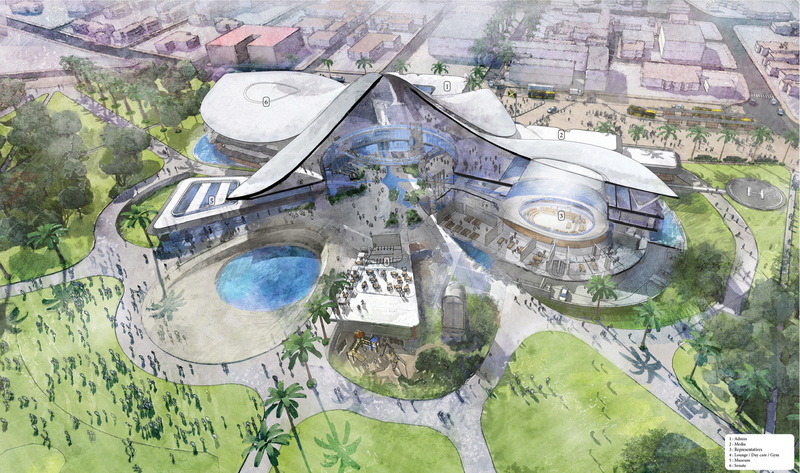 The pavilions converge at the center and support the sculptural ‘petals’ that encourage cooling breeze flow. All office spaces have natural daylight and can be open to natural ventilation and fresh breeze. The building has two main entrances, an urban entrance opposite Torrington Road and a Park entrance opposite in the landscaped space. For the Urban entrance, a paved forecourt adjacent to the street provides both vehicle and pedestrian access to the building. Vehicle access is split with a roundabout. Firstly secure parking traffic that goes through a security checkpoint to an underground basement to the north end of the building. Secondly, minimum security parking and deliveries to an open basement and parking area at the south end of the building. The spatial planning is inspired by the ideal of the transparency of Government Functions for the public. Strategic uses of levels distinguish space use typologies to optimize functionality and security. The circulation and main functioning Government floor is exclusively for government activities on an upper level. The public is provided access on a Park level entrance and an upper Gallery level overlooking the Government floor.